New technologies create immense opportunities, and consequences. When innovating and automating we need to be mindful of human impact. Artificial intelligence (AI), automation, Internet of Things (IoT) and blockchain — these are some of the disruptive technologies that are changing the world as we know it. They are reducing the friction and inefficiencies in markets. They are fostering new innovations that help people live longer, better lives. They are helping under-served parts of the world gain access to microfinancing. And they are allowing companies to develop new products and services that delight their customers. But for all of the opportunities these new technologies offer, there are also consequences. In the race to innovate, automate and streamline their operations, organizations need to be mindful of the human implications. For organizations — and people — it is no longer business as usual. Automation has already challenged the traditional roles filled by customer service representatives, factory workers and data entry clerks. Now jobs long considered immune from displacement by globalization and technology, including journalists, lawyers, stock traders and radiologists, are being disrupted. As a 2016 article in The Economist suggests, “what determines vulnerability to automation…is not so much whether the work concerned is manual or white-collar but whether or not it is routine.” According to a widely-quoted 2013 study about the probability of computerization for more than 700 occupations, 47% of workers in the US had jobs that were at high risk of being automated over a ten to twenty year time period. What determines vulnerability to automation…is not so much whether the work concerned is manual or white-collar but whether or not it is routine. We hear a lot about the tremendous demand for STEM (science, technology, engineering and mathematics) jobs. But how quickly will the rapid advance of AI change that? Chris Devaney, Chief Operating Officer of DataRobot may give us a clue. He told ZDNet in a recent article that while it could take weeks or months for a data scientist to look at a set of data, prepare the data and then come up with an algorithm to make predictions, AI can do it in a matter of minutes. However, this requires defining the task itself, and sometimes this is nontrivial. Of course, as jobs of the past recede, new jobs will emerge. AI and other digital technologies may replace routine work, but it will empower designers and innovators and those willing to create disruption and their own opportunity. We will see significant job displacement as well as job creation. What matters is the ratio of jobs created to jobs lost. It’s important to be realistic and proactive about this. Governments are considering how to respond to the potential social consequences of automation. As Jeff Wong, EY Global Chief Innovation Officer, pointed out at Innovation Realized 17, regulators are seeking to understand and embrace change and to figure out how to reinvent themselves in the face of digital disruption. Indeed, regulators have been challenged to respond by numerous developments in recent years. Gig economy platforms, such as Uber and Airbnb, have tested existing regulations in areas ranging from hotel safety to taxicab licensing to overtime pay. The disruptions now looming on the horizon — blockchain contracts, driverless cars, medical algorithms and more — will strain regulatory paradigms further. Jacobstein argues that regulation should only be one of many tools in the government’s toolbox. 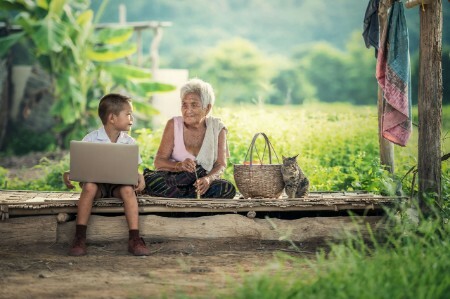 Governments will also need to consider policy changes, such as a universal basic income — something already being piloted in some countries around the world, including Kenya, Finland, Utrecht, the Netherlands, Oakland California, and Ontario, Canada are experimenting with some form of basic universal income — as well as free education and job retraining for displaced workers. Jacobstein also argues that increased taxation and some redistribution of the vast increase in wealth generated by automation will help improve the quality of people’s lives. One option will involve working closely with governments and regulators. As Vanessa Colella, Head of Citi Ventures and Chief Innovation Officer at Citi, points out, “the opportunity for business in working with control functions is not going from ‘no’ to ‘yes,’ but rather getting from ‘no’ to ‘how.’” In other words, this isn’t about viewing control functions as opponents from whom companies want only one thing (an approval), but rather as partners with whom to build a more sustainable and relevant approach and mindset. Fears of job losses have to be seen in context. People should think about AI augmenting the human ability, not about AI replacing jobs. Organizations have to take responsibility for inclusive growth that builds a better world. Governments alone cannot rebalance the working world, nor should they. 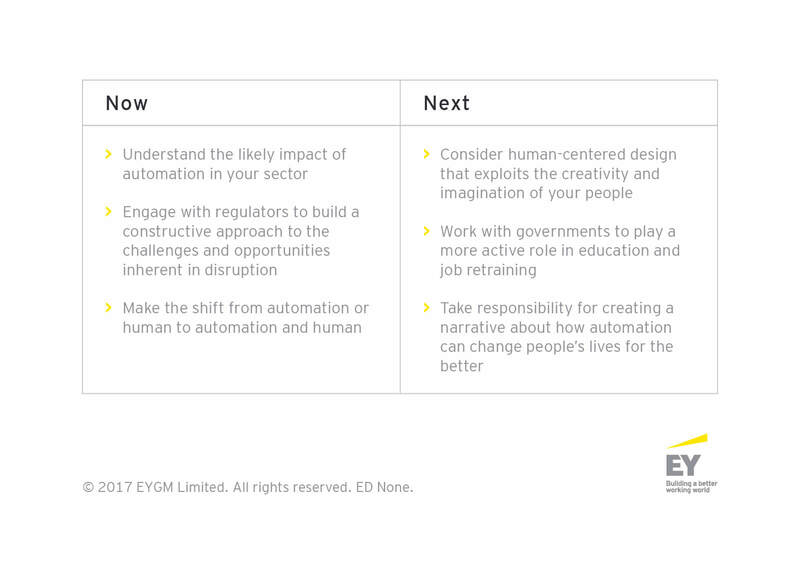 Generated by EYQ, an EY think tank that explores leading and emerging trends, focusing on “what’s after what’s next?”. Explore more insights from Innovation Realized 17 in Powering growth in a digital world. Organizations must take responsibility for inclusive growth that builds a better working world. Governments cannot do it alone.